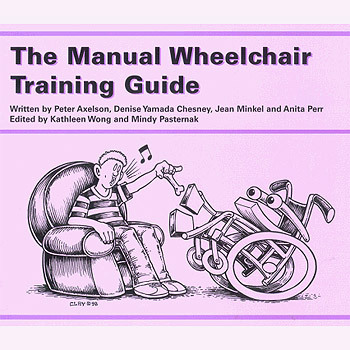 Free PDFs of all the chapters of The Manual Wheelchair Training Guide. It’s useful, with fitting and maintenance tips, and great advice on how to deal with other people’s attempts (welcome or unwelcome, invited or uninvited) to help. And the cartoons are really cute. It’s like being in 1976 all over again, in a good way. You’ll have to get the PDF for each chapter separately. The bound book that you can buy online is paperback and has pages that are wider than they’re long, so it lies open flat. There’s also a Powered Wheelchair Training Guide!